Our lab has a wonderful habit of keeping people around that like to keep their noses down… and we mean this in a good way! Usually the noses in question are pointed squarely at the ground, trying to get a closer look at what may be crawling about. Mack Pridgen’s curiosity of ants started young; and when his daughter was two years old she was intrigued by them as well. It’s hard to miss the telltale signs of a curious toddler: knelt down, stick in hand, poking at the dirt. This behavior is the kind of thing we encourage, promote and model ourselves. She asked questions about the ant behavior; if we collect the red ones and the black ones, and put them together, will they get along? Mack couldn’t wait to get her an ant farm – but the ants he put inside kept dying, and his daughter was quickly saddened (and losing interest) since she, and Mack, didn’t want to keep killing their new pets. He had to come up with a solution where the ants wouldn’t die – after all, two-year-olds aren’t (typically) into dead ants. He explored new materials for constructing ant nests and underwent some serious research and development in order to use the best materials that would keep the ants happy (without mold) and alive while also being sturdy and stable so a knock against the nest wouldn’t kill them. What started off as inspiration for creating a better ant colony for his daughter for Christmas, turned into a successful business and community of ant lovers (check out his company’s Facebook page). Mack’s burgeoning business, Tar Heel Ants, boasts the motto, “Ants can be pets, too.” The ant pet-keeping community has grown and communicates through the Tar Heel Ants Facebook page. It provides both a community and a sounding board for myrmecophiles passionate about keeping ants, safely, as pets (find even more information on keeping a healthy colony here). 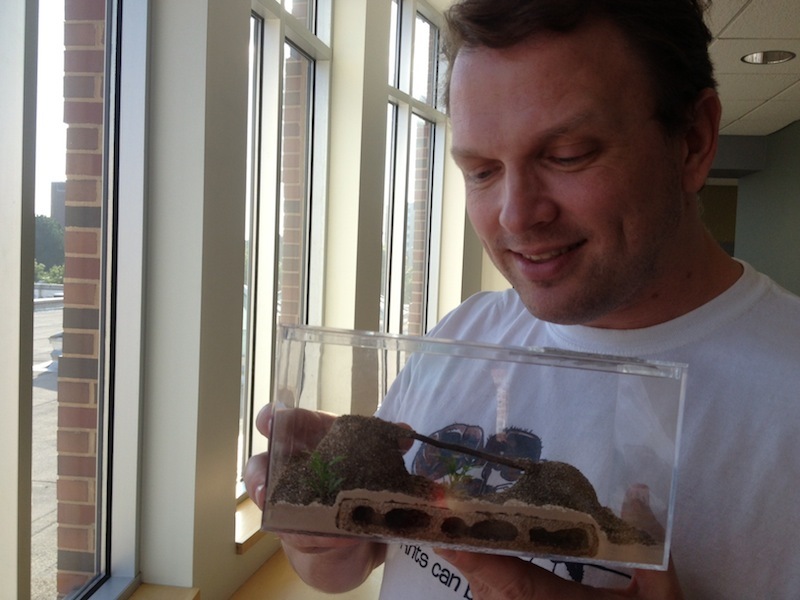 Mack wants to provide an opportunity for all of us to observe the entire life cycle of ants, not just their digging behavior in a stereotypical ant farm. He maintains that when we take the initiative to dig ants from the soil (or shake them from a log) for our own amusement, we take responsibility to provide them a safe and clean habitat. We adopt these ants from the homes they have meticulously constructed in the earth, and from them we have the opportunity to learn their ways; from egg, to helpless larvae, to pupae to adult. We can observe the queen as she tirelessly repopulates her colony and communicates with her workers. 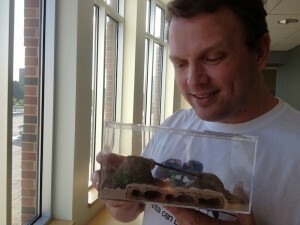 Mack recommends a native woodland ant, Aphaenogaster lamellidens, for his nests (see inset). If one can’t find this particular species, he suggests looking for a recently mated potential queen (see Frequently Asked Questions at Tar Heel Ants). He says, “When a female alate (potential queen) flies from her nest to participate in a nuptial flight, her goal is to mate with one or more males and then immediately land and find a burrow where she will lay her eggs and start her colony. This is the founding stage of colony development, and is by far the most crucial time for a queen if she is to survive. Many factors she has no control over will prevent a colony from ever being possible such as weather, predators, etc. As part of post-mating behavior, the queen will shed her wings by snapping them off and leave them behind. Obviously this makes it easier for her to move in and out of a burrow as she digs or crawls inside a log or hole in the ground. If you find a queen wandering around without wings, odds are she is looking for a burrow to lay her first batch of eggs. Some species will take longer than others to lay their first eggs but most will begin immediately. The lack of wings is a good sign your queen has mated and will soon lay eggs.” Mack explains that you’re likely to find queens moving in a straight line on the ground, versus the side-to-side searching movements that a worker makes. This method of starting a colony reduces the risk of killing ants and gives a newly-mated queen the chance to establish her colony in a safe nest environment. It is also important that the colonies that you establish in your homes as pets are native to your local area – this means collecting them for yourself in your backyard (always check local laws before collecting in a park or other public space); by doing this you also experience the joy of observing the ants in nature! Mack has afforded us a rare and lucky look into the lives of ants, made possible by curiosity, lots of research and development, and an inspiring toddler. It certainly has been a lot of fun working with Mack Pridgen and we are excited to collaborate with him on some fun projects for getting ants into area classrooms! 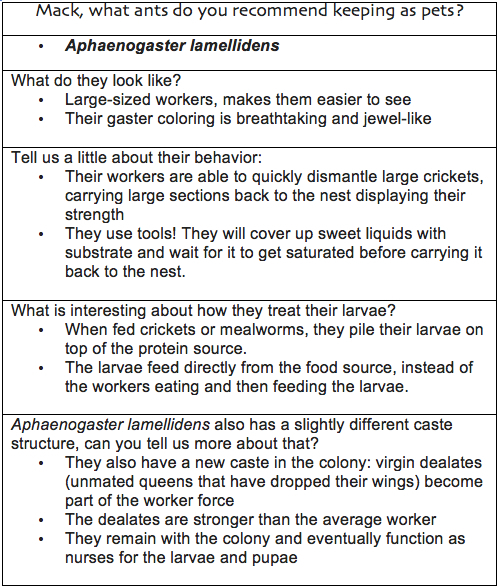 Find out more about Aphaenogaster lamellidens! I really enjoyed this article and also a new ant enthusiast…it is a great hobby and I encourage people to take the time to check it out! 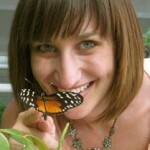 Thank you, Your Wild Life, for bringing this interview to us. I enjoyed it and hope to see more from you about ants in the future.